In a heavy-bottomed pot, melt the butter over medium heat. Once melted, whisk in the flour, and cook until the color shifts slightly darker, about 4 minutes. Add half the stout, making sure the beer is fully incorporated into the roux before adding the rest. Add half the cream, making sure it is fully incorporated into the mixture before adding the rest. Whisk in the mustard and cayenne to incorporate fully with no lumps. Cook until the mixture thickens nicely, 5 to 7 minutes. Be careful not to burn the bottom of the pan. Reduce the heat to medium-low and slowly add the cheddar, whisking after each addition. Be mindful of the heat: if the cheese begins to separate from the roux, cut the flame entirely. Let the rarebit mixture cool completely. Slice the bread 1¼-inch/3cm thick and toast until golden. Let cool and top each slice with 75 grams of rarebit mixture. 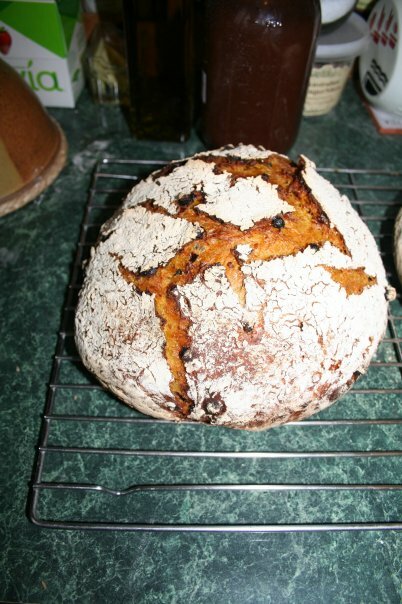 Use an offset spatula to spread the mixture evenly over the top of bread. Broil (grill) until bubbling and slightly darkened. 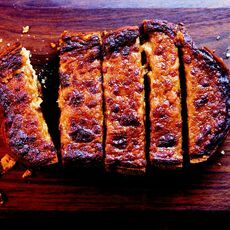 Drizzle Worcestershire sauce over the hot rarebit, slice into 5 pieces, and serve immediately. Roughly chop the bread into chunks, pass under some cold running water quickly to soften (but not soak), and crumble into pieces. Set aside. Add the olive oil to a large casserole or soup pot, and gently saute the onion, carrot, celery, and garlic with a pinch of salt until softened but not browned, about 10 minutes. Add the chile and water and bring to a boil. Add herbsLet simmer gently until the vegetables (in particular the carrot) are cooked through and the broth is fragrant, about 10 minutes. Don’t confuse 7-grain hot cereal mix with boxed, cold breakfast cereals that may also be labeled “7-grain.” Our favorite brands of 7-grain mix are Bob’s Red Mill and Arrowhead Mills. Leftover bread can be wrapped in a double layer of plastic wrap and stored at room temperature for 3 days; wrap with an additional layer of aluminum foil and the bread can be frozen for up to one month. 1. Place cereal mix in bowl of standing mixer and pour boiling water over it; let stand, stirring occasionally, until mixture cools to 100 degrees and resembles thick porridge, about 1 hour. Whisk flours in medium bowl. 2. 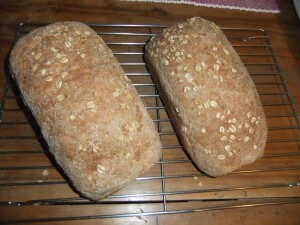 Once grain mixture has cooled, add honey, melted butter, and yeast and stir to combine. Attach bowl to standing mixer fitted with dough hook. With mixer running on low speed, add flours, 1/2 cup at a time, and knead until dough forms ball, 1 1/2 to 2 minutes; cover bowl with plastic and let dough rest 20 minutes. Add salt and knead on medium-low speed until dough clears sides of bowl, 3 to 4 minutes (if it does not clear sides, add 2 to 3 tablespoons additional all-purpose flour and continue mixing); continue to knead dough for 5 more minutes. Add seeds and knead for another 15 seconds. Transfer dough to floured work surface and knead by hand until seeds are dispersed evenly and dough forms smooth, taut ball. Place dough into greased container with 4-quart capacity; cover with plastic wrap and allow to rise until doubled, 45 to 60 minutes. 3. Adjust oven rack to middle position; heat oven to 375 degrees. Spray two 9 by 5-inch loaf pans with nonstick cooking spray. Transfer dough to lightly floured work surface and pat into 12 by 9-inch rectangle; cut dough in half crosswise with knife or bench scraper. 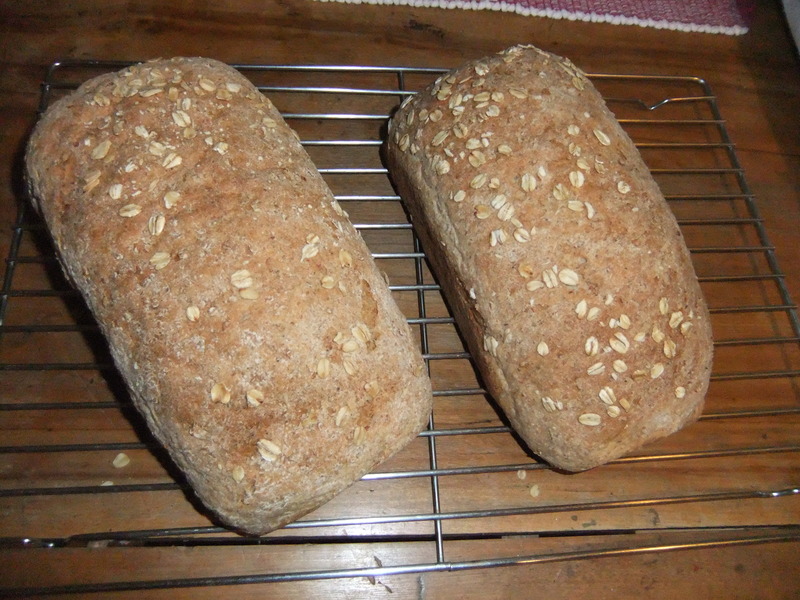 Follow illustrations 1 through 3 below to shape loaves and coat with oats; cover lightly with plastic wrap and let rise until almost doubled in size, 30 to 40 minutes. (Dough should barely spring back when poked with knuckle.) Bake until internal temperature registers 200 degrees on instant-read thermometer, 35 to 40 minutes. Remove loaves from pans and cool on wire rack before slicing, about 3 hours. 1. 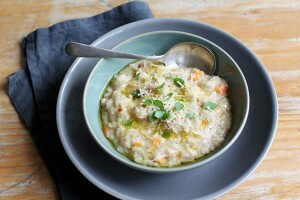 In a medium bowl, stir together flour, salt, and yeast; add carrot juice. Using a wooden spoon or your hands, mix until a wet, sticky dough is formed, about 30 seconds. If it’s not really sticky to the touch, add another tablespoon or two of water. Add currants and walnuts and mix until incorporated. Cover bowl and let stand until surface is dotted with bubbles and dough is more than doubled in size, 12 to 18 hours.